Soma is an ancient mystery. Was it derived from cannabis? Ephedra? Perhaps it was a magic mushroom. Here we explore the history and psychedelic mystery of soma. One of the major mysteries that have puzzled scholars for centuries is the identity of a substance called Soma, which was offered to the gods and consumed by Vedic priests in the religious ceremonies of early Indo-Aryans. The only records of it, which are more than three-thousand years old, call it the juice of a plant that is highly inebriating and productive of godlike states of mind. So what is Soma? While many still ponder, we thought we would take an in-depth look at it ourselves! Soma was brought to India during migrations between 2,000 and 1,500 B.C., along with a branch of the Indo-European system of languages known as Sanskrit. They were by all their own accounts, hard-drinking, hard-fighting, meat-eating, cattle-raising, horse-breeding people, who subdued everyone in their path and, according to recent conjectures based by archaeologists on carbon dating, they probably destroyed Mohenjo-Daro, the great city of the Indus River civilization, around 1,500 B.C. Like most conquerors, they were eventually absorbed by the conquered, who were more civilized than they. However, their language remained dominant and eventually proliferated, as did their religion, to which they were fervently devoted. This religion concerned a number of nature gods: Indra, chief god and lightning bolt hurler; Agni, god of fire; Varuna, sustainer of universal order; the Sun God; and many lesser deities — a pantheon, like the ancient Greeks. The hymns to these gods became an important part of the ancient literature known as the Vedas, and in the Rig Veda, the oldest of the Vedas, there is a large group of hymns devoted to Soma, which apparently had acquired the status of a god. We have drunk the Soma, we have become immortal, we have arrived at the light, we have found the gods. Enter into our heart. While being drunk, O Drop, like a kind father, O Soma, to a son. Like a wise friend to a friend, O Expansive One. Amplify, O Soma, our lives for the purpose of living. With the enlivened spirit of thy juice, may we share, as it were, ancestral wealth. O Soma, prolong our lifetimes, as the sun prolongs the days in spring. Then, even as the last part of the Rig Veda was being composed, the Soma plant disappeared from the literature, and it did not reappear throughout the period of the Vedic commentaries known as the Brahmanas (around 800 B.C.). It was still revered, but substitutes for it begin to be used, and there are records of these substitutes. Apparently, the most common of them was one form or another of the plants Periploca, Ephedra, and Sarcostemma (the last related to milkweed) — plants that, in a vague way, correspond to the description of the Soma in that they are practically leafless and have juice and “nodules”. (The soma plant was often described in the post-Vedic writings as a vallī, or creeper). Other substitutes were grasses, flowers, the sap of trees, the fruit of sacred banyan, and cultivated millet. None of these are inebriating, and their use was probably purely ceremonial. Shortly after 1,000 B.C., the Soma was no longer being employed in the ceremonies, but it had not been forgotten. 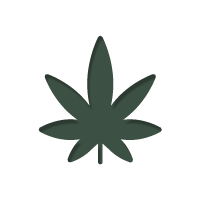 In present-day India, the commonest substitutes are the milkweed-like plants and a fragrant grass no doubt familiar to our readers, named for the Hindu Kush. When the Vedas were discovered by European scholars in the nineteenth century, there was a great deal of puzzlement about the Soma plant. It was thought by some to have been merely a flavouring, like hops, that was added to a fermented drink, like beer. Others thought it might have been mead — fermented honey. The wild Afghan grape and mountain rue were suggested. The noted British archeologist Sir Aurel Stein advanced the theory that the Soma plant might have been wild rhubarb, a plant that fitted the descriptions in that it had fleshy stalks, was reddish, and grew only in the mountains. But rhubarb juice is not inebriating, and its properties are not of the sort that would have aroused the Vedic poets to their rapturous praise and ecstasy. Another hypothesis was also favoured, that it was a drink like the present Indian bhang, a concoction of marijuana still used in sacrifices to the goddess Durga. The mystery remains unsolved. But in the middle nineteen-fifties, it came to the attention of R. Gordon Wasson, an amateur mycologist, and a persistent one, who had long been interested in hallucinogenic mushrooms. Wasson had been a journalist and then a vice president of J.P. Morgan. All during his banking career, he had studied mushrooms, having been introduced to the subject by his Russian wife, Valentina, who was acquainted and enthusiastic about the edible varieties. Wasson pursued his hobby, or his second career, eagerly. He went to Mexico, during the rainy season for ten years in a row to study mushroom use in the remote mountains of the interior. He found, and tried, the sacred mushroom of that region. It was hallucinogenic, all right. It produced a state of wakeful calm in which visions appeared, and then a deep sleep. He had read anthropological reports about northern Siberia, where the native shamans almost universally drank the juice of the Amanita muscaria to induce trances. But the Mexican mushroom did not belong to the Amanita muscaria, or fly agaric family. Wasson became acquainted with Aldous Huxley, who had experimented with the Mexican mushrooms, and they had many talks about them. Huxley apparently thought that the Soma might have been a hallucinatory mushroom. In “The Island”, a novel he wrote just before his death, he described an earthly paradise, rather resembling India, where everybody was happy, and everybody drank the juice of a yellow mushroom. But the idea that the Soma might have been a mushroom had not yet occurred to Wasson. When it did, a few years later, a great deal that he had learned dropped into place. Through friends who knew Sanskrit, some of them Vedic specialists, he undertook an exhaustive study of the Vedas, especially the Rig Veda, with its many references to the Soma. He hired Dr. Wendy Doniger O’Flaherty, then of the University of London, to make an abstract of Vedic references to it, and he consulted the late Louis Renou, the great French Vedic expert. When Wasson had finished his research, he had a mass of information suggesting that the Soma was not only a mushroom but was precisely the Amanita muscaria that is still being consumed by folks today, in northern Siberia. The proof — or the evidence — for the hypothesis was complex, and it drew Wasson into many fields, including linguistics. The evidence was made up of these facts: In the Vedic descriptions of the Soma — which are meagre, though the poetic thoughts about it are strikingly large — there is no mention of the leaves, seeds, fruits, flowers, and roots that belong to any chlorophyll-bearing plant. There is no mention, either, of its being green, black, grey, dark, or blue — the colours of vegetation. The most common Vedic colour epithet for the Soma is hari. Hari is cognate with hiranya (golden) or red, including the German gelb and the English “gall” and “yellow.” Hari has been used in Sanskrit literature to describe the colour red or light yellow, always accenting its dazzling and resplendent character. When the Vedas refer to the Soma as a bull, it is sometimes a red bull. (“Bull” is the equivalent in Sanskrit of anything that is noble and anything that assumes a position of leadership). Other passages describe the Soma as aruna (anything from bright brown to the red of the dawn), arusa (color of the sun), and babhru (reddish-brown or tawny). The juice of the Amanita muscaria is, it happens, reddish brown, and the mushroom itself is bright red, once it has sloughed off its embryonic envelope. A passage in the Vedas (Rig Veda IX, 71) seems to give some of the Amanita muscaria’s life history: “Aggressive as a killer of peoples he advances, bellowing with power. The Soma plant is occasionally referred to as having an eye: “The sun [Soma] looks with the eye toward the dear places and the highest place of Heaven”, “The Soma who has for eye the sun … has spilled forth … he flows throughout the world.” Wasson points out that it is not likely that any creeper, vine, or plant of the milkweed variety would be described this way. But the Amanita muscaria has a fleshy pillar stalk and, as I have said, is bright red. A young Amanita muscaria looks rather like an eye, especially at night, when it glows because of some odd faculty of radiation. The fleshiness of the Soma’s stem is continually referred to in the Rig Veda. Most of Amanita muscaria’s substitutes for the post do not have such a stem; the stems of creepers are generally woody, like the stems of marijuana. To Wasson, the Amanita muscaria theory looked pretty good. 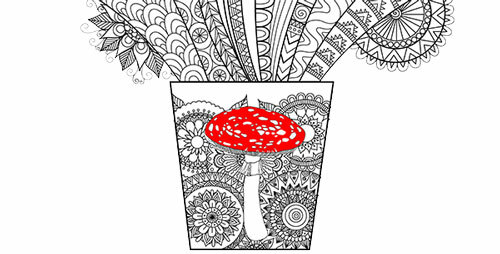 The Amanita muscaria has never been successfully cultivated, even in the laboratory. It grows only at the foot of pine, fir, and particularly birch trees. Most authorities agree that the Aryans came from Northeastern Europe, settled for a considerable period on a plateau near the Caspian Sea, and then invaded the Indus Valley and India. There is linguistic evidence they lived for a time in close contact with a Finno-Ugric-speaking people, who borrowed certain words from them. The homeland of the Finno-Ugric languages is Northern Siberia, but there is historical evidence that speakers of Finno-Ugric came in contact with Indo-European-speaking people near the Caspian Sea around 2,500 B.C. The Amanita muscaria grows at sea level all the way from Kamchatka to Norway. But in India, it grows only in the highest mountains, eight thousand feet and up. It is still found on the mountaintops in the Hindu Kush, and it grows in the Himalayas. In all these places, birches, pines, and firs are plentiful. But they are not found in the valleys south of the Oxus or in the Ganges plain, and neither is Amanita muscaria. 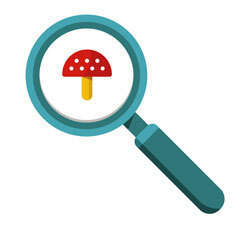 Wasson’s theory is that the Aryans must have run out of supplies of the Amanita muscaria when they invaded Northwestern India; this would explain the absence of the Soma and the reported use of substitutes in the late Vedic hymns and the Brahmanas. The mystique surrounding the Soma persisted for quite a time, however. There is no mention in the Vedas of a valli, or creeper; that term appears only in later literature — written, Wasson believes, well after the Amanita muscaria was no longer being used. If the Soma was to be used for rituals, it had to be preserved for some time. It was dried after it had been harvested; later, the dried stalks were soaked in water and then pressed between stones, or between a stone and a board. The Vedas mention three filters that the juice was passed before it was drunk. One of them was of lamb’s wool. The first filter was thought to be the sun itself, and Wasson quotes passages from the Rig Vega, among them this: “The clear rays of the sun spread over the back of the Heaven, the filter, O Soma ... Monarch of everything that sees the sunlight, Soma cleanses himself. Triumphing over the prophets, he made the word of the way to resound, he who is cleansed by the Sun’s ray, he the Father of poems, Master-Poet never equalled.” The third filter was the priest. Yes, the process of digesting this mushroom, then consuming the resultant urine was an immediate and less-nauseating way of experiencing psychedelia. Revolting? Perhaps. Actually, yes. But for the Aryans, it was the most potent and rapid method of ingestion, as the acid conversion during digestion created more active compounds for further consumption. Mythology, too, has things to say about the Amanita muscaria. Wasson offers a reproduction of a fresco, dating from 1291, in a chapel of the Abbaye de Plaincourault, in France, which depicts an Amanita muscaria as the tree from which the serpent offered the fruit to Eve. In 1924, the Russians discovered an ancient Mongol tapestry (a picture of which Wasson reproduces) in which birds gaze at mushrooms from high cliffs. And a fresco in the Ajanta Caves, in India, depicts what looks like an Amanita muscaria. Beelzebub has been described as Lord of the Flies, and it is a fact that the Amanita muscaria attracts flies and was once thought to kill them, though it merely stuns them temporarily. It was used as a flycatcher in European homes until quite recently. There is room for a great deal of further investigation as well as speculation. Still, this remains the only persuasive hypothesis about the mysterious Soma that has yet appeared.